Sodium is the eleventh element of the periodic table. These sodium facts contain chemical and physical data along with general information and history. Davy isolated sodium from sodium hydroxide using electrolysis. He found a shiny silver metal collecting at the electrode as he applied the current to his device. Name Origin: Davy collected his new element from caustic soda, so he named it sodium. Swedish chemist Jöns Jakob Berzelius used the letters Na for sodium on his table of elements. Soda was known by its Latin name natrium after the Egyptian region of Natron Valley, a large supplier of caustic soda. Natural sodium is comprised of three isotopes: 22Na, 23Na and 24Na. Nearly all sodium in nature is 23Na. Seventeen radioactive isotopes have been produced under laboratory conditions ranging from 18Na to 37Na. Sodium-22 is a stable isotope containing 11 neutrons. Only trace amounts of sodium-22 are found naturally. Sodium-22 is a radioactive isotope which decays into 22Ne by β+ decay. Its half-life is 2.6 years. 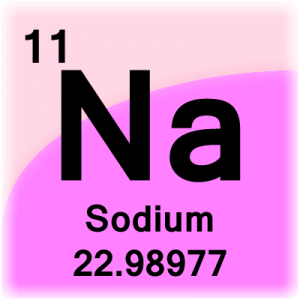 Sodium-23 is the only stable isotope of sodium. It contains 12 neutrons. 100% of natural sodium is sodium-23. Sodium-24 is a stable isotope containing 11 neutrons. Only trace amounts of sodium-24 are found naturally. Sodium-24 is a radioactive isotope which decays into 24Mg by β- decay. Its half-life is 14.96 hours. 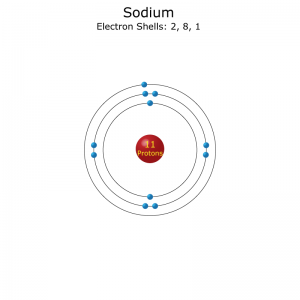 Electron configuration of a sodium atom. Sodium is a soft, malleable and shiny solid at room temperature. Sodium is less dense than water. Sodium metal will float on top of water. Sodium is soft enough to cut with a butter knife at room temperature. Sodium metal reacts with water to produce hydrogen gas. 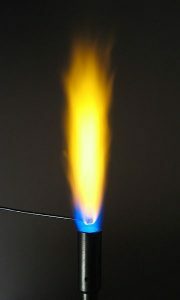 Occasionally, the hydrogen can ignite and give the appearance of sodium burning. Sodium burns with a bright yellow light. Sodium is used in fireworks to produce bright yellow sparks. Sodium is the sixth most abundant elements on Earth. Sodium is the ninth most abundant element in the human body. It accounts for 0.15% of your body. The most common sodium compound is sodium chloride, or table salt. 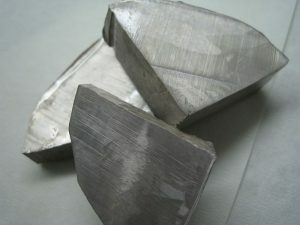 Molten sodium is used as a heat transfer medium in some fast nuclear reactors. Yellow street lights are yellow because the light is produced by ionizing sodium vapor. One early method of obtaining caustic soda (sodium hydroxide) was soaking the ashes of plants in water.